Proposed West Chelsea Historic District. Image: LPC. New York Terminal Central Stores, Real Estate Board, and Cedar Lake Ballet testified against proposed designation. 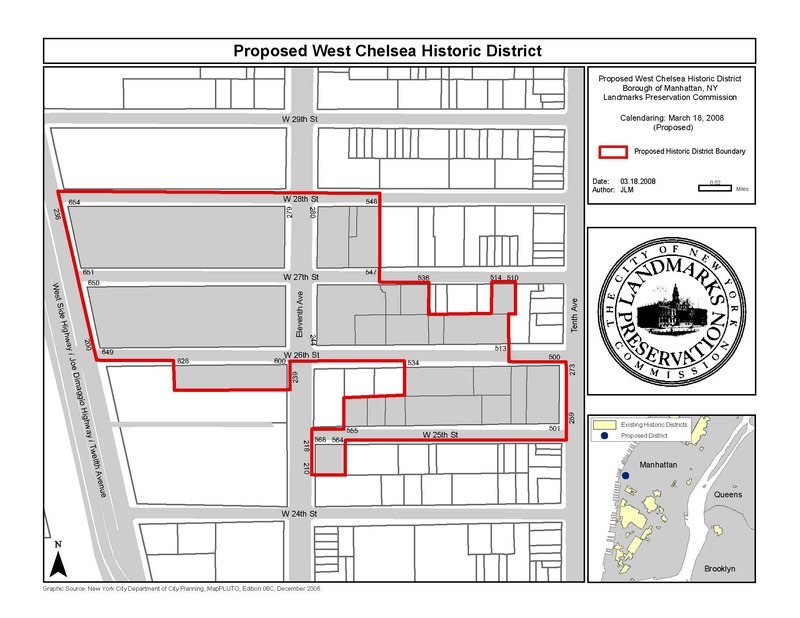 On May 13, 2008, Landmarks heard testimony on a proposal to designate a seven-block portion of West Chelsea as a historic district. Located between West 25th and West 28th Streets, from the West Side Highway to Tenth Avenue, the proposed West Chelsea Historic District would protect brick industrial buildings dating as far back as 1885, some of which housed the operations of industrial giants such as the Otis Elevator Co. and Cornell Iron Works. The buildings represent some of the earliest examples of reinforced concrete construction and modern industrial design. Starting in 1890, competing rail freight companies acquired properties within the district, west of 11th Avenue, for use as storage yards and warehouses. The earliest example is the New York Terminal Warehouse Company’s Central Stores, comprised of 25 interconnected brick buildings, measuring 1.2 million sq.ft. of space, and spanning an entire block between West 27th and 28th Streets. At the hearing, Michael Slattery of the Real Estate Board of New York testified against the proposal, arguing that the industrial buildings in West Chelsea are “not particularly unique” and that Landmarks should not rush to designate based on a perceived need to save industrial space. Greg Mudd, Executive Director of Cedar Lake Contemporary Ballet, which is located within the proposed district on West 26th Street, also opposed the proposal. Mudd claimed that designation of the area would blunt, if not prevent, Cedar Lake’s efforts to expand its facility to meet its growing demand. Several speakers testified on behalf of New York Terminal, urging Landmarks to vote against designation. Roland Betts, Chairman of Chelsea Piers, argued that the New York Terminal complex does not warrant designation, unlike the nearby Starrett-Lehigh Building, which was designated in 1995. However, Betts, along with Coleman Burke, managing partner of New York Terminal, suggested that if Landmarks insisted on designation, it should include in the historic disinteresting trict only four of the complex’s 25 buildings. Attorney Margo Flug of Greenberg Traurig, representing an automobile dealership located at 270 11th Avenue, argued that the dealership should not be included in the historic district because it has recently undergone “extreme alterations” and could not comply with the district’s design standards. Chair Robert B. Tierney concluded the hearing, stating that it would be continued in early June. LPC: Proposed West Chelsea Historic District, Manhattan (LP-2302) (May 13, 2008).